So I pick out a lake I can easily drive to and I try it out. First trip conditions were horrible and I wasn’t there for long. Second trip I marked a bunch, played the chase game, caught two or three and lost a substantial fish. I’m psyched.. in it to win it. Third trip I bring a buddy and nuthin. Buddy senses my enthusiasm and agrees to go a second time. One mercy smallmouth on a tip up but that was it. Two days later I do a solo trip and cover seven miles of water. Hit 6’ down to 60 feet. Fished next to vacant shanties I figured were chumming and every inner curve and point I could find and walked three miles back to the car in pitch black (that was awesome actually) .... lots of perch but don’t think I marked a single laker. Yes, im going back first chance I get (prob Wednesday) but I don’t think my buddy is on board for any future trips and I honestly wouldn’t ask him to. This is a public service message from someone with a problem. Lol, sounds like lots of my trips chasing perch, just had one of those again last weekend. I honestly wonder why we do this to ourselves. Yea, I wonder that myself. Must be the challenge of figuring a lake out that makes us keep going back. Skunk, love your post. Your drive is awesome. Most people do not get that kind of drive for anything in life. I plan to live forever. So far so good! Ahhhh. The agony of defeat. Keep at it and you'll eventually have the victory. I felt the same way when i started chasing pike.stick with it it will pay off. Because of the familiarity of both species (depth and location) maybe you could start by looking for white perch. 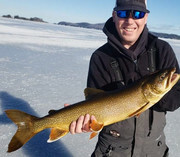 It has been stated by some anglers that where you find the whites, you can usually find the lakers. Lakers. Ya. I pretty much won't go after anything else. Might have a shot at a 20lber on this next trip. Early morning, afternoon to late evening. When I first hunted deer, I used to smash through the woods "still hunting" LOL. I'd spend 12 hrs beating brush and see nothing, or here and there a tail wave at me as they all left. I began focusing on the times of day I saw them actually moving around, and started seeing more deer, getting more deer and I learned a lot. Lake trout are like that as well: they eat until like 10 or 11 at the latest, and stop until evening. BUT! They're still trout... if you're not offering exactly what they're currently gorging on, you won't get them to bite. Stupid togue... they don't even taste all that good. I don't bother with them any more; I'd rather catch a mess of crappie or perch. Scott64a I disagree completely but what do I know. heard you guys marked some massive ones last weekend. hopefully with the panoptix you can coax them into biting. Caught...not just marked . Ive been lazy about posting pics...maybe end of season. You know which lake ill be on this evening. Good luck. I was there Sunday and it was super slow. This rollercoaster of emotions and continuous letdowns pretty much sums up the excitement of fishing for me. If you can't find peace and joy on the days when you don't catch any, then in my opinion you are fishing for the wrong reasons. I have had my fair share of skunk days, slow days, medium days, and the occasional fire hot day. I'd say you have the drive and that is what gets you that fish you never forget and plenty of fishing trips you will never forget. For me, when I am not catching fish I drop down every single thing in my tackle box. My most recent laker trip was discouragingly slow. 1 laker between two of us on a two day trip. Marked a few others but never had them hit. We punched over 40 holes and only marked fish in 1 of them. The one that I did end up catching was on the biggest metal spoon I had (was a deep water trolling spoon, not even an ice fishing spoon) and I was slamming it on the bottom. Fish didnt even show up on the flasher he was so low to the bottom in 55 FOW. It was also the middle of the day (that time when lakers "dont eat") but I think I just happened to piss him off enough or he thought it was an easy big meal, not sure. Keep after it. If you want to catch lakers, think like lakers. Learn when they eat, what they are eating, where they hide, where they feed, where they rest, what colors they like, what scents they like (store bought raw shrimp landed me my only fish last trip), what size they want. And remember that all of it will change as soon as you think you figured it out Be a student to the fish as your teachers. But most of all, enjoy it. Ice fishing is a ridiculously silly thing to do. It can be incredibly fun or incredibly frustrating, but it is always super silly when you think about what we are actually doing. Nothing some green light cant fix. Picked up one of those over the weekend. Going to give it a try on Champlain. Hopefully I can get some smelt for bait. Those lights are so cheap on Amazon I'm going to pick up a few more for my boat to light up for squid. Every new type of fishing I’ve ever tried works the same way. Do some research and try it out. Usually beginners luck puts a couple fish on the hook within the first two trips and I get all excited and dive in only to find out its more nuanced than I originally thought. I then pour myself into it (often pulling my hair out) until enough “aha” moments happen that I’m able to catch fish on the regular. Once simply catching becomes old news I focus on targeting large and go through the hair pulling and aha moments thing again. Bass, trout, stripers and channel cats have all gone the same way. Add to that the peculiarities of each spot / body of water and the learning curve gets a little steeper. I love that. Gotta say though, the laker game is more like hunting than any style of ice fishing I’ve tried yet. No camping out and putting back beers, just covering water and trying to think tactically. Still haven’t done the crack of dawn thing with em. Schedules been crappy so just going when I can which almost invariably winds up being in the “no bite” window. Haven’t called out sick in a couple years so thinking I might be due. Not to mention there is a chance you can jig a monster. Here are a few of the better ones from this season. Getting one over 32" has proven difficult through the ice at least. The top one looks almost sinister.